Learning to play the violin requires years of hard work and dedication, especially if you are interested in the instrument professionally. 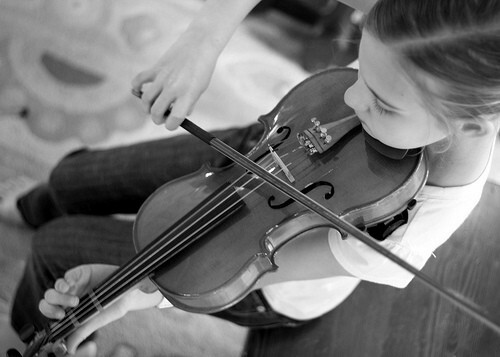 Whether you are looking to take a violin lesson from a violin teacher or if you want to work on your own, there are a few violin practice tips you can incorporate during your next practice session to keep you on track. Whether you are planning to learn the violin on your own or if you are interested in working alongside a violin teacher, consider creating a practice schedule when you want to begin learning the violin. Having a practice schedule or scheduling a violin lesson with a professional violin teacher on a regular basis and set schedule is a way to stay disciplined with the progress you are making while learning new pieces and techniques with the instrument itself. Although it does not matter how long you practice playing your violin each day or throughout your lessons, it is important to keep in mind the progress you are making with each session you have. Working to fix errors and improve your violin technique is essential, as the quality of your practice sessions matters much more than the number of sessions you have or the time you spend in each session individually. Using a music stand is highly recommended any time you practice playing the violin, whether you are having a violin lesson with a teacher or practicing in your own home. If you prefer sitting, a stool with a soft cushion is ideal for the most comfort while allowing you to maintain good posture as you hold the violin in place. You may also need a pencil to mark any potential trouble spots you run into when you are playing a challenging piece you are struggling to master. Noting difficult spots of pieces gives you the ability to focus on specific sections to help with quickly improving your technique when you choose to play the song in its entirety. Choosing a location designated for practice each day is also essential if you want to focus and concentrate more on your music and improving your overall skill. Having a designated location in your home for practicing the violin is a way for you to instantly change your mindset into the mode of practicing and working to improve your technique, rather than being distracted by other comforts such as televisions and computers. Before you begin any violin practice session, be sure to eat a healthy snack and to keep your body hydrated by drinking enough water. Take a bathroom break prior to practicing and ensure you feel comfortable before you begin to minimize the number of breaks you need to take in between playing pieces and working to fix any errors you make. Warming up is essential before practicing the violin. Finger stretches, using scales, trills and arpeggios all help with limbering the muscles in the hands and fingers themselves, which helps with more difficult songs and pieces. Create a goal for each violin practice session you want to complete, whether you are interested in finishing a piece in its entirety or if you are focused on a specific section of a song. Working on challenging sections and problem areas of pieces is essential to help with bettering your technique. Taking a violin lesson with a violin teacher or practicing on your own is a great way to quickly advance with understanding the violin and its complexities. The more time you spend working with a schedule or attending a violin lesson with a violin teacher, the easier it becomes to read just about any violin piece you are interested in playing, regardless of its level of difficulty.